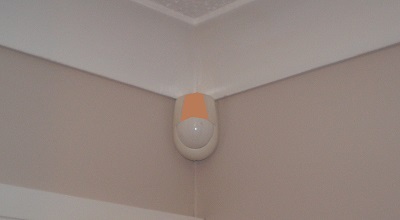 Passive InfraRed (PIR) motion detectors are critical in many security systems, yet they are often considered ugly or intrusive. ******* ***** *************, *** **** ******** ** **** ** ******* applications, **** *** ********* ** **** *** ********** **** **** plastic ******. *******, ******* *** * **** ** ***-******* ******** sensors ** ****** ****** ** ****. ** **** ****, ** ******* ***** *******, ******* ************ and *******. *** ****** ******* *** **** ** ******* ***** ******** *******; from ********* ******, ** ********** ****** *******, *** **** ***** surveillance. ******* ********* ************, *********** ******* *** ***, *********, *** designed *** '******* ******* ***.' **** ********* ******* (**** *** PIRs) *** ******** ** ** **** ** *** **** ***** in *** **** ***, ********** ** *** ****** ** ********** of ************* ** *** ****** ** *********. *********** **** '*********** PIRs' *** ******* ****** ** '***** ******'*** ******* ** ******* ** ********* ** ****** *****, ******** *** ***** *** *** *** *** ***** *****. *** **** *********** ********** ******* ************ ** ***** ***** ** *** ******* **** *** *****. Most *** ******* *** ***** *** ***** ***** **** ***** or **** ******. *******'* **** ** ******** **** *** ******** surface, **** *** ******** ** *** ****** ******* ****** *** hole (* */*" ****), *** ******* ~*/*" ** ********. **** ** * ******** ******* ** ******** ****** ****, *** also ** ********* ************ **** **** ******* **** ** *******. Rather **** ***** ** ***** ******* ***** ******* ** * wall, *** *** ** ******** *** **** *********. *** *:******** - * ******, **** ****** ****** ***** *** ********* movement ** ******* ********* ** ******** ***** ***** ****** ******* may '***** *****' ***** ** ***** ******* *** ******** ** adjacent *****. *** *:***** ****: * ********** ****, *** **** ***** ******, ****** *** covering **** ***** **** * **** ******* ********. *** *:**** ****: *** ****** ***** ******, ******** ** ** *** degrees of *****. *******, ***** *** ********* *** ****** *** ****** ** * range ** **********, ********* ******* *** *** ********** ** ******** - * ******* **** ** ******* '**** ***' ****. *** ******* *** ****** ****** ******* $** - $** ******, depending ** *** ********** ****. **** ** **** ********* **** many '*** ******' ********* ***** ***** **** (**: ~$**), *** are **** ********* ** ******* ***** ** ********* ******* **** RTE ** ******* *****. **** ***** ****** *** * *******, **** ******* ***** ******'**** **********'**** **** ******* **** **** *** (**********) **** ****** ** detect ****** ****** ********. '**** ****' ******* *** **** $** up ** $***, *** *** ***** ***********/ ******* ******* ***** of * *** *** *** ********** ****** ** ******* ******** with * ***** **** ******** **** * **** ********** ***. ****** **** ******* * *********** *** ** *** **** ********** wall, ***** ** ************ ******** **** *** **** ** *** staircase, * *** *** ** **** ******** ** *** **** and ***** * ***** ******* **** *** ***** ** *** staircase. ****** **** ********* ****** **** **** ****** ****, *** detection **** ** ***** *** **** **** * *** **** surrounding ***** ******. ******* *** *** ****** ** ***** *** ********, ******* *** readily ** ******** **** ***** *** **********, **** ** ******* that ***** ** ***** *** '***********' ****** *** ***** ******* units. *** ******** *********** *** *********** ** *** ****** ** key ** ********, *** ***** *********** ******* *** ******* ** where **** *** ** ******, *** ****** *** ******* **** **** more ****** *********. **** ** ****** ******** ***** * *** **** ** ************ effectiveness, ****** ******** *** **** ** *** *** ***** *********. If *** '***** *****' **** *** ** *** ** ****** sticking *** ***** ********* ****** ** ** ***** ********, ***** SPY ***** ******* ***********, *********, ****, ** *** ****** *****.